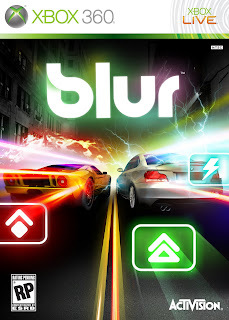 Former Microsoft-exclusive developer Bizarre Creations is working on wrapping up their latest racing creation, in the form of Blur; this time published by Activision. A new take on the standard racing career formula, this new game will blur the lines between realistic racing action, and the arcade-like fun found in any of the "Kart" games. You won't just race around a track, attempting to out-drive your opponents; you'll have access to an assortment of power-ups, including shooting other cars with bursts of energy, boosting your speed, and more. From looking at the video below, you'll see some of these examples. I get the feeling it's going to be a cross between their own Project Gotham series, injecting a storyline from the Need For Speed games, and polishing up with the action from a Mario Kart. Check out the latest trailer showcasing the development team talking about their latest (bizarre) creation.